Science as a destiny: Cheers! Having a blast at Pint of Science 2017! Cheers! Having a blast at Pint of Science 2017! This past week, I have visited more pubs in Sheffield than during the past three years put together– but don’t worry, it’s all for a good cause! 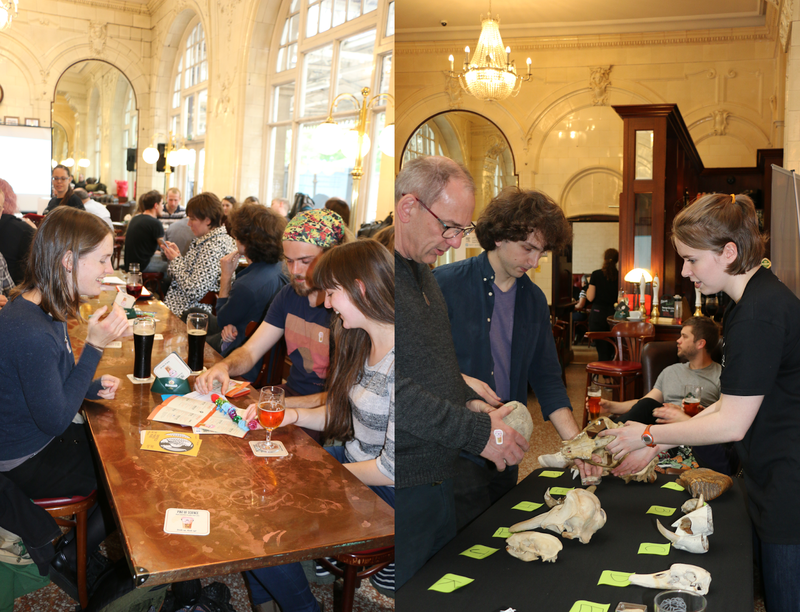 After MONTHS of planning, preparation and promotion – PINT OF SCIENCE 2017 finally landed in Sheffield! As you may know, Pint of Science is an international science festival where the public meet real researchers in pubs for fun evenings filled with discussions, science demonstrations and interactive activities. The festival first came to Sheffield last year and I helped as a general volunteer for one of the ‘Planet Earth’ themed events. I enjoyed it so much, that I enthusiastically took on the role as Head of Social Media and Publicity for this year’s festival. At the time, I didn’t realise quite what a daunting task this would be: this year, the festival was double the size of the 2016 event, with twice as many events over the three days. It was a big gamble; would this dilute our audience too much? Would we be able to fill each venue? Nevertheless, I set myself an ambitious aim of selling 95% of tickets and launched myself into writing press releases, crafting videos, arranging radio interviews and tweeting for all I was worth. But the tickets just weren’t selling! I began having nightmares of the speakers turning up to find only a handful of people in the audience…and as publicity manager, I would feel entirely responsible. 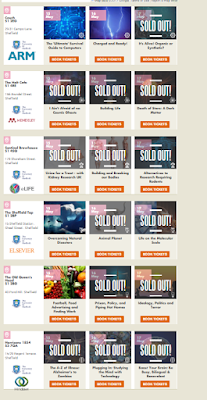 A friend calmed me down, telling me that Sheffield had a reputation for waiting until the last minute to book tickets for events. I didn’t believe her…but it turned out she was right! In the final few days, the tickets suddenly began to fly – nearly every time I checked the computer, another event had run out! In the end, 14/18 events were completely sold out, and we shifted 778 tickets (94.3%)! I think I can be happy with that…! 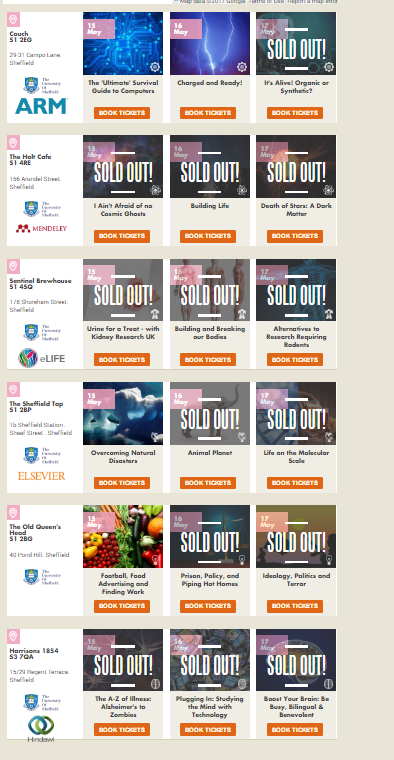 14/18 of our events in Sheffield sold out - result! During the festival itself, my main duty was to capture as many different scenes as I could to use in promotional material next year. But I did manage to catch a few of the talks. In ‘I Ain’t afraid of no Cosmic Ghosts’ Dr Ed Daw covered my 6-week cosmology online course in about 20 minutes, as he galloped through the discovery of gravitational waves, before promptly launching into an improvised jazz performance. At the ‘Boost Your Brain: Be Busy, Bilingual & Benevolent’, I learnt the science behind why sitting quietly and doing nothing really is good for the soul – and our physical health too. Meanwhile, over at The Sheffield Tap, hosting the ‘Planet Earth’ events, I enjoyed Jennie Crawley’s presentation of her research on the timber-working elephants of Myanmar; a population that has a uniquely close bond with their human caretakers. Then in the 'Our Body' events, Dr Allan Pacey gave a particularly entertaining argument against the widely-held belief that modern life is threatening male fertility. Each venue had a distinct ambience, from the staidly traditional Old Queen’s Head in a medieval timber building; to the Sentinel Brewing Co, where you can see the entire being process – from ‘grain to glass’- while you drink; to the cosy side room at Harrisons 1854, which felt more like being in someone’s living room! The Sheffield Tap made a great venue for our Planet Earth themed events - guess the skull anyone? Judging by the amount of discussion, laughter and engagement on the night, besides the audience feedback so far, just about everybody had a good time. I’ve already got my fingers crossed that Pint of Science will be returning in 2018! I’ve learnt so much from helping promote the 2017 event and would relish the chance to put it all into practice again. Probably the most beneficial thing to me was going from a complete novice to being able to put together a video from scratch. 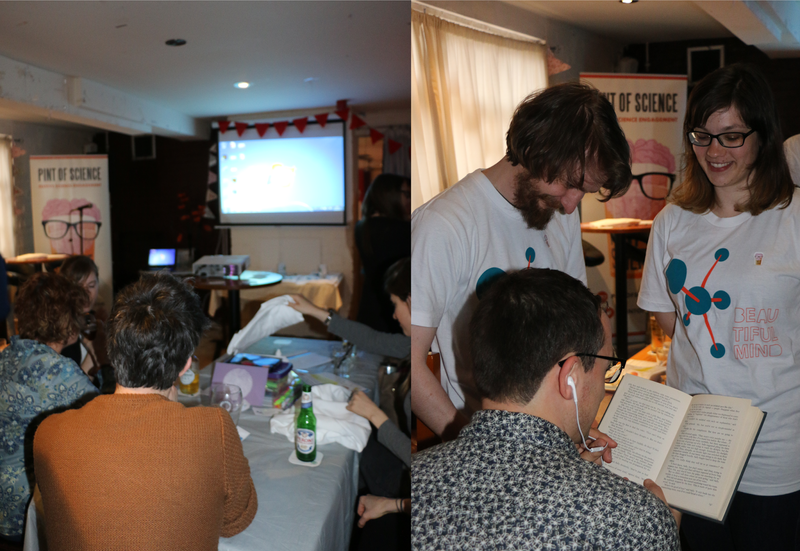 Harrisons 1854: a more intimate venue for our Beautiful Mind events, where audience members could take part in their own brain-related experiments! Thanks for reading, have a good weekend!